Fourth of July fireworks are behind us for another year, but, that won‘t keep jazz piano star Larry Fuller and his trio from lighting some musical explosions at 7 p.m. Friday in a benefit concert at Degage Jazz Cafe, 301 River Rd., Maumee. Sponsored by the Toledo Jazz Orchestra with support from Jazz Spectrum 91, the evening promises to bring Toledoans the liveliest keyboard inventions from Fuller. He’s a Toledo native who has built a stellar reputation from coast to coast as a brilliant sideman who knows how to connect with his audience. Fuller, modest in person but aggressive at the keyboard, never forgets anyone who helped him along. He grew up during the heyday of Toledo’s own lively jazz scene, mentored by the late Floyd “Candy” Johnson. In his early 20s, Fuller moved into long-term partnering with top performers, from singer Ernestine Anderson to bassist-bandleader Ray Brown to guitarist John Pizzarelli. Now, he’s striking out on his own, ready to move from sideman status to greater visibility – and responsibility. This concert is part of an Ohio-Michigan tour, a chance to take his career to the next rung on the ladder of success. His discography is lengthy and star-studded. It includes three albums with Pizzarelli, five with Hamilton, several with Anderson, and more. He’s especially proud of Easy Walker, his first title album, made during his years playing and touring with Brown and percussionist Jeff Hamilton. Two album cuts are Fuller’s own compositions. One, “Candy’s Blues,” is a tribute to the late Johnson, the internationally renowned saxophonist who retired to Toledo and taught in Spencer-Sharples schools. In the 1970s he started the All-City Jazz Ensemble, fertile ground for Toledo’s blossoming jazz talent. Then, Fuller, one of five kids of a North End glass factory worker, was learning to play on a piano his older brother had hauled off the curb. With determination and basic instruction, Fuller soon discovered ways to use 10 digits to bring 88 keys to life. After winning the audition for Johnson’s group, while just into his teens, he also gained a talented mentor. Johnson was still in demand and shared some of that privileged view of the professional jazz world with young Fuller. That relationship continued until Johnson died suddenly, just before Fuller’s entry into junior year at Central Catholic High School. “To have that kind of mentor,” Fuller says, kick-started his career. 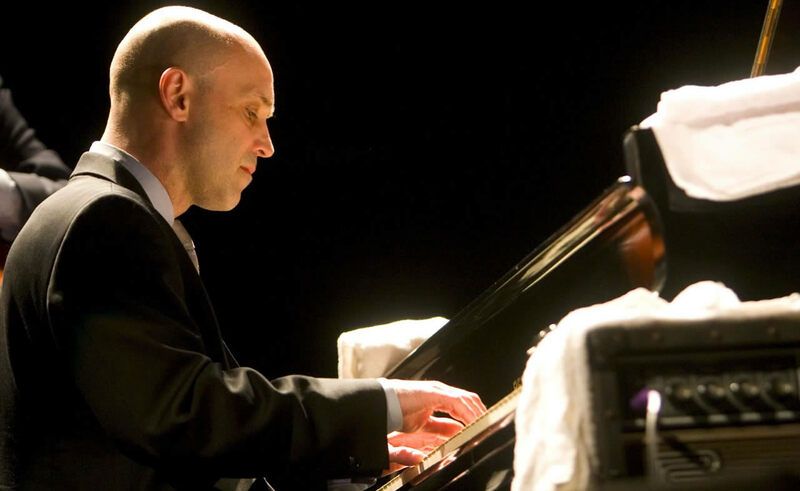 “After high school I played with the Murphys, and studied piano with Mark Kieswetter.” He became a regular at Rusty’s Jazz Cafe and started building a regional rep as a pianist who could really swing. While on a gig at Ann Arbor’s popular Bird of Paradise nightclub, Fuller was discovered by Anderson. “I was playing with a local rhythm section – the drummer was George Davidson – and we played three nights with Ernestine. She liked my playing so much she asked me to tour with her,” recalled Fuller. Anderson was in her 60s; Fuller was 23. She was his ticket out of the Midwest. “It was kind of like my first break in terms of busting out of the local scene,” he said. “She liked the fact that I would swing when I play, could generate a certain rhythmic feel,” said Fuller. Through Anderson he met other top players and the rest is, well, history still being written by Fuller. He’s readying his first album release since cutting the musical cord. Due around Sept. 1, the eponymous Larry Fuller, on the Capri label, also will feature drummer Greg Hutchinson (another graduate of Ray Brown University), and bassist Hassan Shakur, who worked with Duke Ellington. In Toledo he’ll play with percussionist Pete Siers and bassist Paul Keller. They’re also booked into Kerrytown Concert House in Ann Arbor and Steinway Hall in Detroit. he show is actually to be in Langley Hall, upstairs fromDegage, said Scott Potter, a longtime trumpeter with the TJO and a board member. “The hall can seat 120 and we hope to have a sell-out.” The concert timing was set to enable listeners to finish out their evening at Degage, where house music is always on hand to accompany fine dining. Tickets are available through the Toledo Jazz Orchestra Website, thetoledojazzorchestra.org, or by calling Brian at 419-297-5972. Tickets are $25 at the door.